Refurbished laser scanner assembly. For use in the HP Color LaserJet 4600 series, not for use in the 4610 or 4650 series. You may need to replace a laser scanner if you are experiencing any of the following error codes on your LaserJet 4600: Error 51.2c, 51.2y, 51.2m, 51.2k . Call us with any questions 866-352-7108. NOTE: This is considered a major repair. NOTE: This is considered a major repair. Please check out our installation instructions to be sure you want to attempt the install. 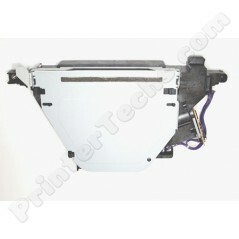 Refurbished laser scanner assembly, for the HP Color LaserJet 4600, 4600N, 4600DN, 4600DTN. (Not for use in the LaserJet 4610 or 4650 series). You may need to replace a laser scanner if you are experiencing any of the following error codes on your LaserJet 4600: Error 51.2c, 51.2y, 51.2m, 51.2k . There is one laser scanner for each of the 4 colors. The scanners are identical for each toner so the part numbers are the same for any of the 4 scanners.